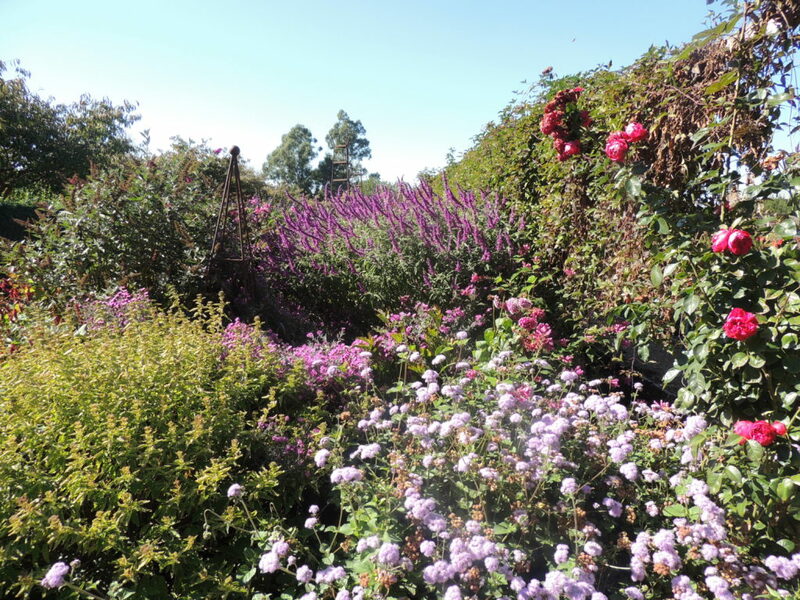 I've been inspired by David Glenn's Lambley Garden in Central Victoria ever since I became a serious (but uneducated in the science of horticulture) gardener about eighteen years ago. I've bought quite a few plants from there by mail order. So it was with much anticipation that I approached Lambley a couple of weeks ago, during our recent road tour of Victoria. We had been staying in the charming town of Daylesford, and Lambley is only a short drive away. Victoria, like so much of Australia, has been starved of rain for some time, and the countryside we passed through, although very beautiful, is also very dry. Although I didn't get to meet them, I've learned that David and his artist wife Chris Canning have lived at Lambley for nearly thirty years. Soon after arriving there David realised that the climate dictated that he would have to concentrate on the kinds of plants that could cope with extremes of temperatures, from mornings of -8C in winter to highs of 40C+ in summer, rather than the gentle flowers of his native England. 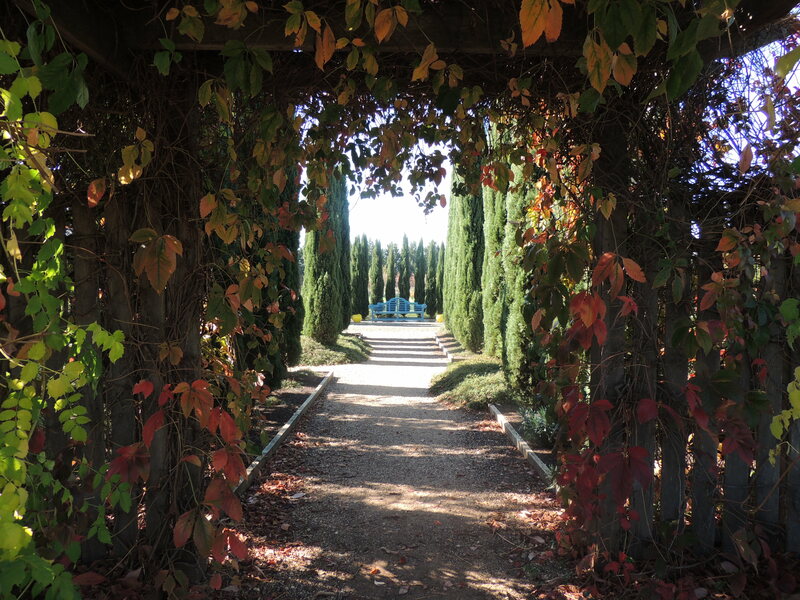 Lambley is a series of 'rooms' containing a dry climate garden (which is seldom watered), a Mediterranean garden, a flower garden and a vegetable garden all connected by gravel paths and tree-shaded walks. Around the perimeter of the whole is a two metre high European privet hedge which helps to shelter the gardens from the hot dry summer winds of this area. 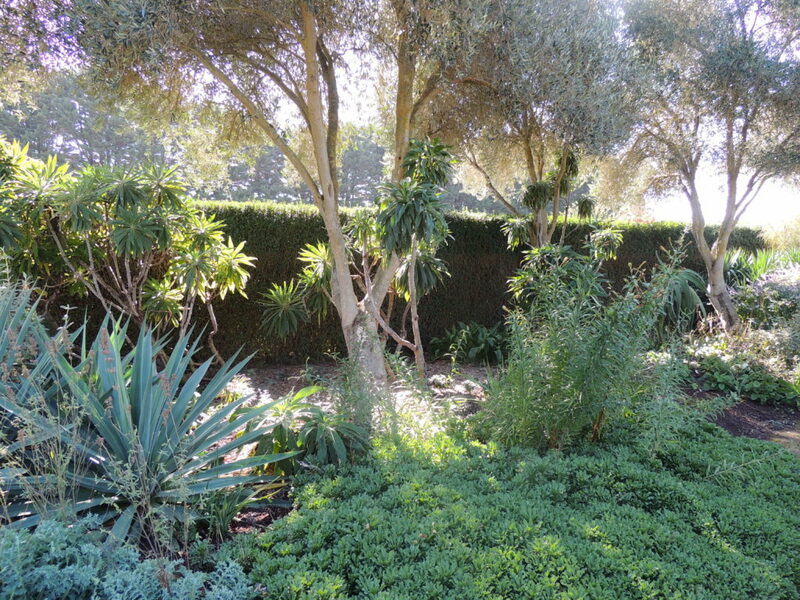 The Dry Climate garden is entered through a single opening in the impressive hedge. Inside are five lofty olive trees, the branches of which have been pruned high so that the sun can reach the hardy plants beneath. 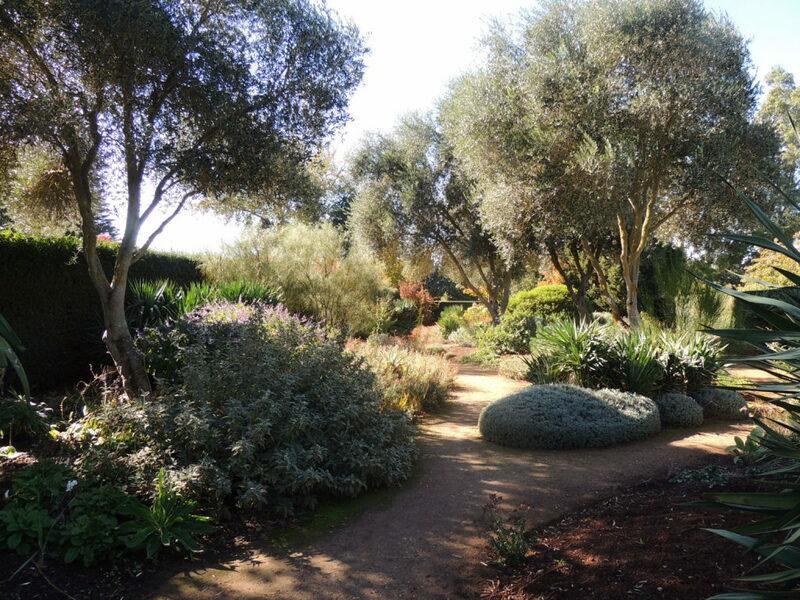 The visitor can follow gravel paths and admire a selection of plants from Australia as well as from Turkey, Mexico, California, Southern Europe and other places where hardy plants are found. The occupants of the garden are watered in at planting and then left pretty much to their own devices. Apart from whatever rain falls, the dry garden might receive three more waterings a year if necessary. 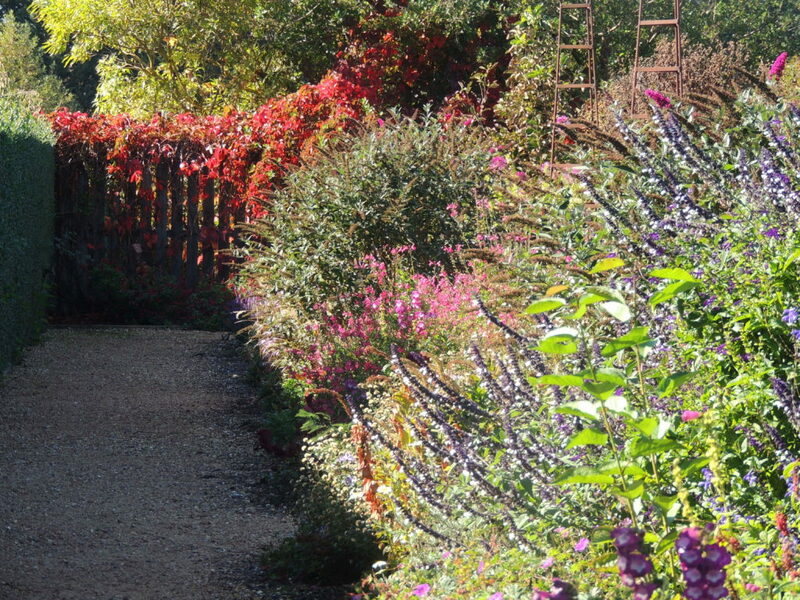 The Mediterranean garden has an abundance of bee-laden perennials filling wide borders with bounteous colour and volume, overflowing onto paths, and at this late stage of the season, creating a mesmerising tangle of hues and shapes. Above: Here Nepeta has all but obliterated the path to an urn in the background while bright uplifting Dahlias compete with Clematis for a slice of the action. And looking at the urn from the opposite direction, the visitor sees a much more formal aspect with carefully clipped hedges flanking an immaculate path. The pear walk, planted with Pyrus calleryana, has an underplanting of white Japanese anemones and a beautifully kept grassy sward. Look how the sun dapples through the leaves onto the path. Another formal walk, this time bordered by Mediterranean cypress, Cupressus sempervirens. I thought the blue bench was Italian, but I’ve learnt it’s an English Lutyens bench, thank you Christina. I expect if I’d read more about Gertrude Jekyll I might have known that! It looks striking at the end of the walk. We had a more than pleasurable visit to this garden and it certainly lived up to my expectations. I loved walking along those paths admiring all the plants and the dedication that has gone into making this place such a showpiece. Was there a nursery? Yes, there was, but bearing in mind that I was going to have to keep my plants alive, in the car, for the best part of two weeks, I was circumspect in my purchases and bought only some small pots of perennials and some tulip bulbs. One more word about Lambley: there is no charge to enter! David Glenn says he wants everyone to be able to enjoy the garden. Nor is there any pressure to buy, but of course you want to, having just seen such amazing beauty. Have you been to an open garden or nursery that you really enjoyed? I'd love to hear about it. You can click on the links to see more of Lambley (and there are gardening notes) or Chris Canning's artwork. Wow! what a beautiful garden. I would say the blue bench is more Moroccan than Italian and its shape is a pure English Lutyens bench! I love the planting in the dry ‘room’ and the Mediterranean planting is interesting but that must be irrigated quite significantly to be so lush. Thank you so much for sharing and I hope you enjoy (enjoyed) the rest of your trip. I see what you mean about the bench, Christina! I think the enormous hedges around all the gardens provide a great deal of shelter from the elements and reduce the amount of water needed. What a beautiful garden! Lots of texture and colour. How generous tomopen for free! Yes, many gardens charge, and there’s often far less to see than there is at Lambley. What a great garden! I liked the Mediterranean the best! What it must feel like to sit and gaze at that garden every morning! It would be pretty special, wouldn’t it? How beautiful is this garden and evidence of the fact that we don’t need to use lots of water all the time. You’ve reminded me that I want to plant some Japanese anemones. I must look for some. I’d like some too, Carol, but I don’t have enough shade yet, or big hedges to shelter my garden. A gorgeous garden. I love that bountiful border. How tempting to want to buy up large. Maybe a trip for you one day, Pauline? I’ve read about this property and I’ve previously saved photos of it on one of my Pinterest boards. I enjoyed seeing it through your eyes too. What an inspiration it is to those of us facing similar climate challenges. Thanks for sharing it, Jane! Thanks, Kris. It seems Lambley is well-known in gardening circles and it’s easy to see why! I knew nothing of this garden. Thanks for sharing it with your lovely prose and exquisite photography. Can’t wait to visit it plus of course, the plants you purchased in your garden. Thanks Di….Perhaps a trip in the caravan? We really enjoyed our Victorian sojourn. What an absolute thrill for you to see Lambley, Jane. It is just amazing. Who would have thought of using a weedy bush like privet for a hardy hedge! I guess keeping it clipped like that prevents it escaping to the bushland. And how nice to have that little patch of green. Goes to show that if you create the right micro-climate you can grow many things, even grass, without much water. I think a bit more watering happpens in the areas outside the dry garden, Tracy, but even so, it’s a garden that exists very well on not a lot. Certainly not from the sky, anyway! I don’t usually like formal gardens but that shot of the urn and the manicured plants & path leading up to it is stunning. When you turn to the right from the urn, Vicky, there’s a view that’s anything but formal. It’s the photo I posted with the clematis and nepeta all over the path! So the visitor sees the formal and the wildly casual. A beautiful garden. I wonder if the blue Nepeta is Salvia. We also live in a rather cold and hot climate at The Southern Highlands and the different varieties of Salvias are thriving despite lack of water. One tree that also does very well is the Manchurian pear. It is turning a bright red right now. Yes, the blue plant could be salvia. There are a lot of salvias growing at Lambley. I guessed Nepeta because it’s falling over, which salvia tends not to do, in my experience (which is not wide). We have Manchurian pears in the main street here and they’re really very lovely just now. You were right, Gerard. I’ve discovered that the blue plant is salvia- Salvia azuria. 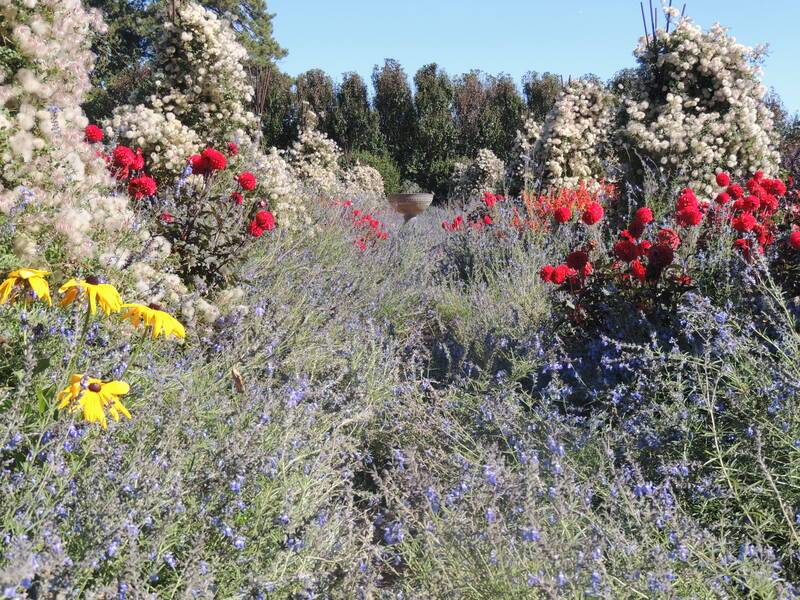 What a beautiful example of gardening in a harsh, challenging climate. I absolutely loved the shady, treelined pathways. They were beautiful to walk through as well, Anna. Inspiring to see how appropriate plants thrive in harsh conditions. 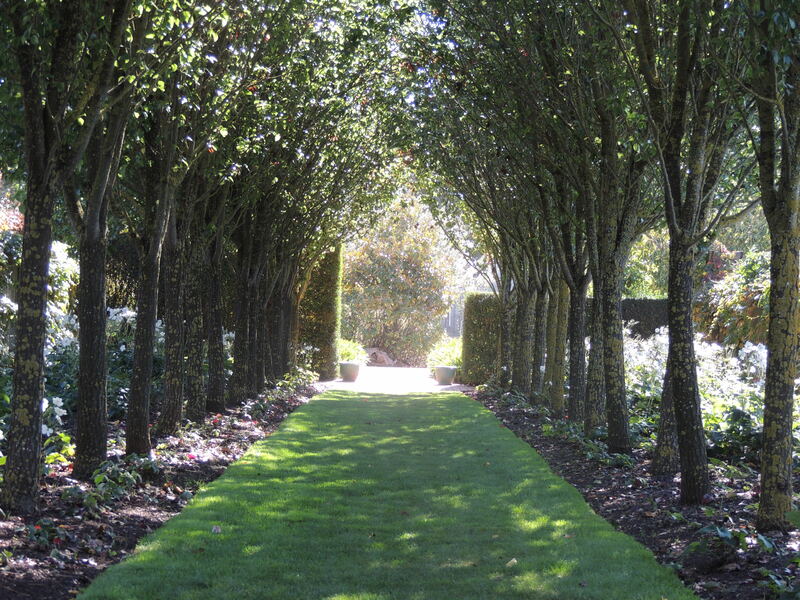 The idea of planting ‘rooms’ bordered with treed pathways is a great way to beak up the spaces. 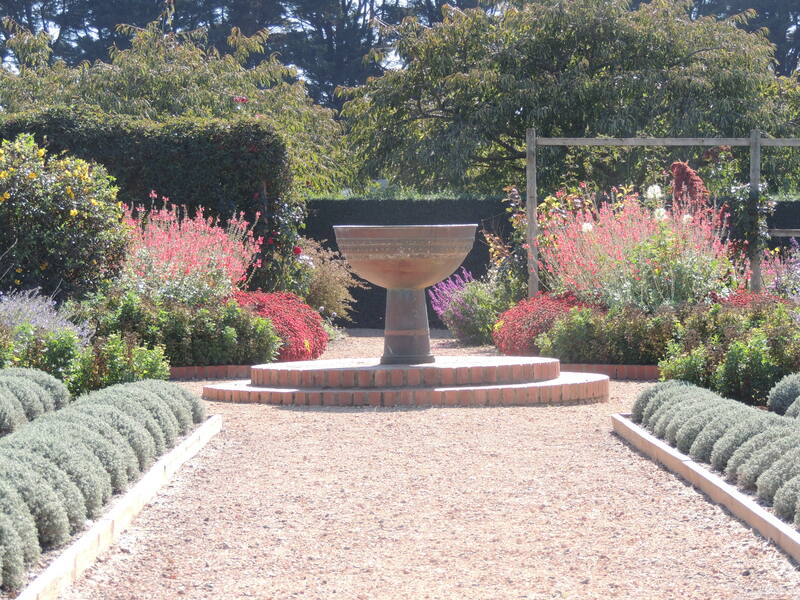 Another inspirational garden although I’ve not visited in person but have avidly followed is Peter Adams’ blog on Windgrove in Tasmania. Overcoming the challenges from the elements and herbivores with appetites his zen garden looks so masterful. I hadn’t heard of Windgrove. What a huge project it has been! There are some wonderful aerial shots on the blog which give a good view of all that has gone into it over the years. How brilliant to juxtapose formal and informal side by side near the urn. It makes a thoughtful contrast. Yes it does: very interesting to stand by the urn and compare the two.